Clearly designed with specialist duties in mind, in the right hands the ORBIS range makes an ear-shredding alternative to regular cymbals. Unusual tonalities. Decent value. Dramatic, ferocious attack. They're not suitable for every genre. On its arrival in June 2014, Stagg's SENSA series was the Chinese company's first all-new range of cymbals since 2005. 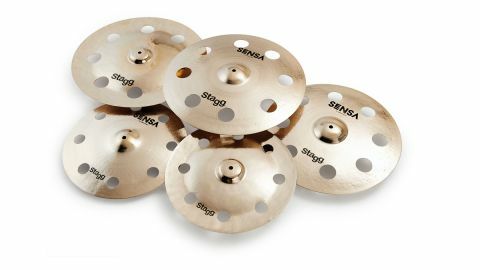 Designated as a pro-level, all-round series, SENSA's bright, sweet response is described by Stagg as being ideal for drummers 'searching for cymbals with flexibility and variation of tone'. At the Winter NAMM convention in Los Angeles earlier this year, Stagg announced that six effects cymbals would be joining the SENSA range. The SENSA series sits within Stagg's B20 Pro Custom collection, alongside the similarly distinctive Vintage Bronze, Classic, Black Metal, Furia and Myra ranges. "The cut-outs encourage attack, reduce decay and effectively short-circuit the cymbals' tonality"
This grouping is separate from the company's SH and DH series, which are paired together under the title B20 Pro Versatile. Common to the multitude of cymbals on offer is Stagg's near-legendary value for money. The half a dozen new models - known collectively as SENSA-ORBIS cymbals - consist of three crashes and three chinas in 16", 18" and 20" diameters. Like existing SENSA models, the cymbals are finely lathed across their entire surfaces with a slightly more defined band taking up from just outside the bell area then going inwards. They are also peppered with tiny hammer marks (save for the bells), leaving them thoroughly pock-marked, before being polished to a brilliant finish. All of this work is done by hand while, at the beginning of the process, each cymbal is individually cast from B20 bronze. In weight and profile terms the cymbals largely mirror the SENSA models that they are based on, with the exception of the chinas which don't include rivets. If the SENSA series as a whole has been designed to be versatile then the new models are unambiguous in their intent. All six of the cymbals feature eight cut-outs, positioned close to the edge. The holes vary in size from 40mm (16" crash and china), 50mm (18" crash only) and 55mm (18" china and both 20" cymbals). Their inclusion is to encourage attack, reduce decay and effectively short-circuit the tonality by preventing a smooth transference of energy across the cymbal. They also - perhaps unintentionally - make lifting the cymbals out of a case and onto a stand (and vice versa) a cinch. Taking a beautifully finished cymbal and then deliberately punching large holes in it is a strong visual statement in itself, implying an almost destructive sense of creativity; the result can't help but suggest an equally dramatic impact on the cymbal's sound. Of the three crashes, the 16" model is probably the most recognisably crash-like. Bright and high-pitched, it opens quickly, swells and decays in a manner similar to that of a regular crash. Tonally however, it's an altogether different proposition; while it's not as abrupt or exotic as a china, the note is laced - if not infused - with trashiness. For a 16" cymbal it is surprisingly loud as well. "Hitting it with the meat of the stick finds it slicing across the mix. There is little sweet or smooth in the sound - it's all about impact"
Stepping up to the 18" crash cymbal finds any pretensions to regular crash duties being more or less abandoned. Here the response is unapologetically trashy and cutting - the extra two inches does bring with it a lower note and longer decay, but the opening brightness is notched up considerably - as is the volume. Hitting it with the meat of the stick finds it slicing - there really is no better word for it - across the mix. There is little sweet or smooth in the sound - it's all about impact and it brings a degree of punctuation to stabs and stops that is impossible to miss. The 20" crash is louder and more belligerent still - it's practically half-cymbal, half-weapon. The level of attack is ferocious and the overall effect is genuinely eye-watering. While the main business of a blast of atonal frequencies is over almost immediately, the decay does ring out for some time. Though these cymbals were almost certainly built with noisy scenarios in mind, playing the 20" crash quietly reveals a subtler side to it. Gentle tapping gives a sharp stick sound that is surrounded by layers of conflicting wash. The bell reacts positively when played with the stick tip, but doesn't really light up when being shouldered. It's way too leftfield to be considered a go-to ride sound, but it does provide a radically different option for those exploring non-mainstream territory. By their very nature, Chinas err on the discordant side of things, so in theory adding holes shouldn't make as big a contrast as with the crashes. All three of the chinas are deliciously warm and dark and, thanks to what's missing, ultra-aggressive. The 16" is particularly sharp and wastes no time in getting straight to the point, while the 18" brings with it added depth and packs more muscle. The 20" is massive in all respects - the note is huge while its level of projection is enough to make the front row duck. Like the 20" crash, the largest china will also respond to being ridden, bringing fabulously convoluted tonality to the proceedings.